(CNN) -- The credit crisis has transformed the global financial landscape, bankrupting established names and prompting unprecedented interventions by governments and central banks to save others from collapse as they buckle under the weight of "toxic debts." This timeline charts the key moments in that process. Feb. 7: HSBC announces losses linked to U.S. subprime mortgages. May 17: Federal Reserve Chairman Ben Bernanke said growing number of mortgage defaults will not seriously harm the U.S. economy. June: Two Bear Stearns-run hedge funds with large holdings of subprime mortgages run into large losses and are forced to dump assets. The trouble spreads to major Wall Street firms such as Merrill Lynch, JPMorgan Chase, Citigroup and Goldman Sachs which had loaned the firms money. Aug.: French bank BNP Paribas freezes withdrawals in three investment funds. Sept.: Crisis-hit UK bank Northern Rock admits financial difficulties as it asks Bank of England for assistance. Share prices fall as customers queue up to withdraw their money. Oct. 1: Swiss bank UBS announces losses liked to U.S. subprime mortgages. Oct. 5: Investment bank Merrill Lynch reports losses of $5.5 billion. Oct. 15: Cititgroup announces $6.5 billion third quarter losses. Oct. 24: Merrill Lynch announces losses to be over $8 billion. Jan: Swiss bank UBS announces fourth quarter losses at $14 billion. Jan. 11: Bank of America pays $4 billion for Countryside Financial. Jan. 15: Citigroup reports $18.1 billion loss in fourth quarter. Jan. 17: Merrill Lynch reports $11.5 billion loss in fourth quarter. Washington Mutual posts losses. Feb. 13: UK bank Northern Rock is nationalized. March: UK hedge fund Peloton Partners and U.S. fund Carlyle Capital fail. March 16: Bear Stearns, the U.S.'s fifth largest investment bank, collapses and is taken over by JP Morgan. April 1: German Deutsche Bank credit losses of $3.9 billion in first quarter. April 13: U.S. bank Wachovia Corp. reports big loss for quarter. May 12: HSBC writes off $3.2 billion in the first quarter linked to exposure to the U.S. subprime market. July 22: WaMu reports $3.3 billion loss for second quarter. Aug. 31: German Commerzbank AG takes over Dresdner Kleinwort investment bank. Sept 7: Fannie Mae and Freddie Mac effectively nationalized by the U.S. Treasury which places them into "conservatorship." Sept. 9: Lehman Brothers shares plummet to lowest level on Wall Street in more than a decade. Sept 14: Lehman Brothers files for bankruptcy. Stock markets plummet; Central banks inject billions of dollars into money markets. Bank of America agrees to buy Merrill Lynch. Sept. 16: AIG Corp, the world's biggest insurer, bailed out by the U.S. Federal Reserve. Morgan Stanley and Wachovia enter merger talks. Sept. 17: Halifax Bank of Scotland (HBOS) to merge with UK bank Lloyds TSB in an emergency rescue plan. Sept. 18: Federal Bank and other central banks inject billions into global markets to help ease the crunch. Sept. 22: Japan's Nomura Holdings buys Lehman's Asian operations for up to $525 million. Sept. 25: WaMu sold to JP Morgan. Sept. 27: HSBC announces 1,100 job cuts worldwide. - U.S. Congress rejects $700 billion plan to bail out the U.S. financial system. - German bank Hypo Real Estate to be bailed out by banks and government. - Citigroup, the world's largest bank, says it will buy Wachovia. - Belgian giant Fortis is bailed out by Netherlands, Belgium and Luxembourg. - Royal Bank of Scotland shares lose a fifth of their value. - Iceland part-nationalizes Glitnir, one of its biggest banks. - Belgian bank Dexia bailed out by France, Belgium and Luxembourg. - Swiss bank UBS announces small profit in third quarter. - Irish government guarantees safety of bonds, debts and deposits. Oct 1: US Senate passes amended $700 billion bail-out plan. - US Congress passes $700 billion bail-out, President Bush signs it into law. - Swiss bank UBS to cut 2000 jobs. - Dutch government nationalizes banking and insurance activities of Fortis. - Proposed Hypo Real Estate bailout collapses. - Chancellor Angela Merkel announces new plan for Hypo bailout worth $69bn. - Merkel also announces guarantee of deposits in German banks. - UK raises limit on guaranteed bank deposits from £35,000- £50,000. - EU leaders meet in Paris for emergency summit to discuss financial crisis. - Battle rages between Citigroup and Wells Fargo over purchase of Wachovia. - Wells Fargo and Citigroup agree to legal standstill in battle for Wachovia. - Bank of America reports 68% profit drop, stock sale to raise $10bn. Oct 7: Icelandic bank Landsbanki nationalized; Icesave, Landbanki's internet bank, freezes UK customers' accounts. - UK Treasury announces £500 billion bank rescue package. - U.S., UK, China, Canada, Sweden, Switzerland and ECB cut interest rates. - IMF forecasts "Major global downturn". Oct 9: Iceland nationalizes its biggest bank Kaupthing. - G7 finance ministers meet in Washington and issue a five-point plan. - Nikkei falls almost 10%, biggest drop in 20 years. - FTSE falls more than 10%, closes at 8.85%; worst daily fall since 1987. - Oil prices fall to $80 a barrel. - Dow crashes nearly 700 points before regaining some lost ground. - Icelandic bank Kaupthing is nationalized. - The Fed rubberstamps Wachovia takeover by Wells Fargo. - 15 EU leaders meet in Paris for emergency summit on crisis. - Gordon Brown urges them to adopt similar measures to UK bank rescue plan. - Leaders agree to guarantee loans between banks until end of 2009. - Germany, France and Italy to announce individual plans Monday. - Australia agrees to guarantee deposits for next 3 years. - New Zealand guarantees bank deposits for 2 years. 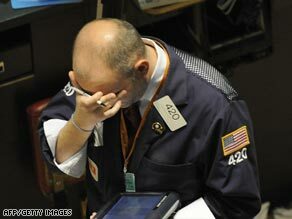 - EU stock markets bounce back in response to EU leaders' bailout announcements. - UK bails out 3 banks: RBS, HBOS and Lloyds TSB at cost of $63 billion. - Bank of England loans $174 million to Icelandic bank Landsbanki to help repay UK depositors. - Iceland in talks with Russia to negotiate emergency loan of $5.44 billion after bank collapses. - U.S. follows UK lead by part-nationalizing banks. - European and Asian stock markets fall after initial upswing. - Southeast Asian nations agree to start fund to provide financial support to countries in crisis; World Bank commits $10 billion to the planned fund. - Russian stock market posts losses as RTS Index falls below 800 points. - Global markets fall on fears of global slowdown. - Citigroup delays merger of its Japanese brokerage units due to costs involved. - Swiss government bails out UBS with $59.2 billion. - Credit Suisse posts 1.3 billion-franc third quarter loss; raises $8.7 billion from investors. - Hungarian central bank gets cash injection from ECB to value of $6.7 billion. - EU leaders at Brussels summit call for complete overhaul of international financial system.